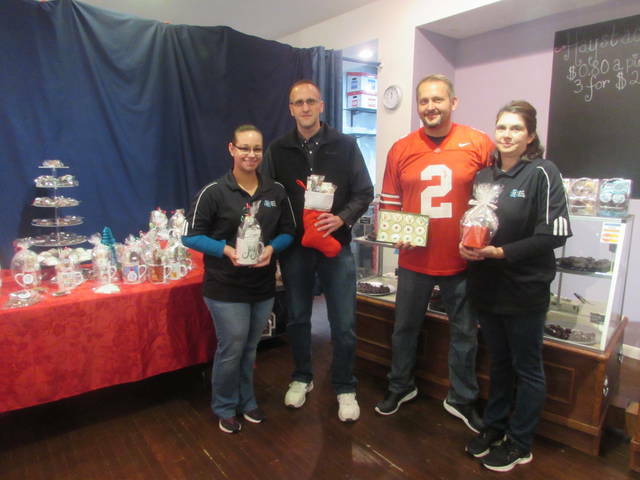 From left are Dawn and her husband Jason Hunt, co-owner of Hunt Brother’s Candy, and Dave Hunt, co-owner and his wife, Dora. OTTAWA — Hand dipped chocolate, truffles, caramel, caramel apples and chocolate pretzels are all treats Ottawa natives and brothers Jason and Dave Hunt sell to help satisfy their customer’s sweet tooth. The brothers opened their business Hunt Brother’s Candy at 110 N. Walnut St. in downtown Ottawa Saturday. The business was started in 2014 by Jason who always had a vision of opening the candy business in Ottawa. His wife, Dawn, who also helps at the business encouraged him to look into opening the business. Hunt Brother’s has been located on Court Street next to the courthouse in the Ohio Bank building for its wholesale and fundraiser business. “The original focus of the business was manufacturing and wholesale sales to other businesses and organizations,” Jason said. They were approached about doing fundraisers that quickly became a growing part of their business. “Over the last couple of years, we have helped raise thousands of dollars for hospital charities, school organizations and various other organizations in northwest Ohio,” Jason said. The gift shops at both Lima Memorial and St. Rita’s hospitals sell some of Hunt Brother’s products. Dave said the brothers have had their eye on the downtown Ottawa space on Walnut Street for the last few years. “The downtown areas was hit by the floods and it has shown a lot of resilience,” Dave said. They hope the business will draw people from outside Ottawa into the downtown. “It’s candy, and you can’t go wrong with candy. I have been a connoisseur of candy for the last 48 years and it’s exciting to see the smiles on children’s faces when they walk through the door,” David said. Dave and Jason are co-owners of Dairy Whip on Columbus Grove. Sweet treats at Hunt Brother’s Candy range from nut clusters, white and chocolate dipped oreos, chocolate dipped graham crackers, meltaways and turtles made with caramel and pecans. Other options are chocolate covered almonds, fudge, coffee beans, and chocolate covered marshmallows. For the holiday season customers can purchase a holiday mug with chocolates inside or a festive colored box of chocolates. A large portion of the products they sell are made in house and hand dipped. “We are known for our maple nut clusters made with real maple syrup,” Jason said. In addition to fundraisers, they also supply candy for weddings, parties and special occasions. The brothers decided to open a retail location after some encouragement from many people looking to buy more candy they had originally purchased from fundraisers. The candy counter and display cases were originally used at Paul’s Hardware located on Main Street in Ottawa. The cases were restored by Dale and Alice Tobe, the brother’s aunt and uncle. Hours are 9 a.m. to 6 p.m. Wednesdays, Thursdays and Fridays and from 9 a.m. to 2 p.m. Saturdays. People can call ahead for orders at 888-496-4652.
https://www.limaohio.com/wp-content/uploads/sites/54/2018/11/web1_IMG_1666-1.jpgFrom left are Dawn and her husband Jason Hunt, co-owner of Hunt Brother’s Candy, and Dave Hunt, co-owner and his wife, Dora.